An extra large Crisp provided the crispiest experience the bag had to offer. The first three bites provided a snappy crackle, but it all turned mushy very quickly. While most of the bag constituents were whole, they were also mostly flat. They were thin cut regular Crisps with very few visible oil boils and hardly any seasoning on the surface of the Crisps. A Nose Plunge Test suggested a somewhat fatty meat aroma. The greasy lard like substance that is left behind after a joint of meat is cooked sprang to mind. Fortunately, the flavour was somewhat more rewarding. 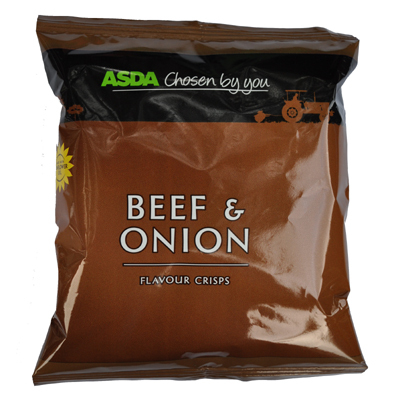 A few Crisps at once were required to get the maximum flavour available, but there was a beef stock type of flavouring, added to by a slightly sweetened potato, with a definite hint of Onion. The flavours were all pretty muted, but at least the Crisps didn't taste of lard!